U.S. withdrawal from the Paris agreement is deeply concerning to leaders in the Pacific. The decision by President Donald Trump to withdraw the United States from the Paris Agreement on Climate Change has caused much concern across the Pacific. Pacific Island states are some of the most vocal advocates for aggressive carbon reduction targets, and the Paris Agreement had been welcomed at the time of its creation by Pacific Island states. For many Pacific Island states, the current forecasts for rising sea levels due to climate change will severely impact their territory. For island states such a Tuvalu, Kiribati, and the Marshall Islands, rising sea levels are a genuine and immediate existential threat. These island states exist on territory that rises only a few meters above sea level, at best. This means that any rise in the sea level, no matter how incremental, eats into their very limited landmass. The current predicted sea level rise of 2 meters by 2100 would mean an almost total submersion for these three states. Other Pacific Island states will also be greatly affected. Five low-lying islands within the Solomon Island archipelago have already been submerged. Changes in both geographic features and water temperatures also have the potential to alter the fishing stocks that Pacific Islands states rely on for food security. 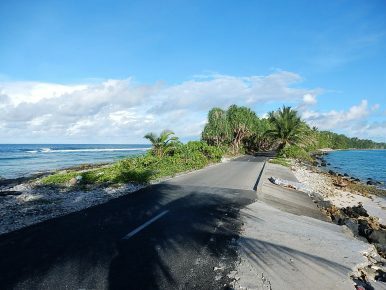 Tuvalu’s Prime Minister Enele Sopoaga was so concerned by Trump’s decision that he ordered his country’s officials to cancel any cooperation with the United States until Washington has a new climate change policy in place. In regards to Trump’s decision, Sopoaga stated: “I think it doesn’t make any sense to talk about any other thing if we don’t fix the problem of climate change… We are very, very distressed, I think this a very destructive, obstructive statement from a leader of perhaps the biggest polluter on earth and we are very disappointed as a small island country already suffering the effects of climate change.”The global, stateless, nature of the climate change phenomenon is keenly understood by Pacific Islands. With little capacity to stem this threat to their existence themselves, these countries rely on the big players to instigate reforms that might prevent more drastic warming of the Earth’s atmosphere, oceans and surfaces. Trump’s decision came right before Fiji assumes the presidency of Conference of the Parties (COP), the annual forum for countries that signed up to the 1992 United Nations Framework Convention on Climate Change. The forum will be held in Bonn, Germany from November 6-17 this year. Fiji’s presidency is a historic event, as it is the first Small Island Developing State to hold the presidency. Fiji’s presidency was designed to highlight the problems that climate change is producing for Pacific Island states — not just rising sea levels, but more intense weather events causing severe destruction, like Cyclone Winston last year, which caused damage valued at 10 percent of the country’s GDP. In his speech to the UN Climate Change Conference in May (a precursor to the COP23 forum in November), Bainimarama reaffirmed Fiji’s commitment to the goals and the implementation of the Paris Agreement. He outlined his vision that Fiji’s presidency of the COP would have the interests of small island states at its core, wishing to build a coalition of partners to help these states build greater resilience against rising sea levels and extreme weather events. Trump’s decision to withdraw from the Paris Agreement severely undermines Bainimarama’s position, and Fiji’s prominent role in a major multilateral forum. While Pacific Island leaders have been disappointed with Trump’s decision, that other major powers have reaffirmed their commitment to the Paris agreement will give them some solace. The recent India-Pacific Islands Sustainable Development Conference held in Suva, Fiji, is an indication that other significant powers have an understanding of the situation that Pacific Island states are in. The hope will be that the recalcitrance of the world’s major power will only be temporary, and a future administration will reaffirm its commitment to the Paris goals.